Microsoft Outlook is no doubt the best email client for Windows. But it is not free. It has excellent mail management features that improve the productivity of the user. It is a part of Office 365 suite. The MS Office suite is not available for free. Its license per user costs within 60 to 200 dollars. Due to its huge range of features and simplicity of use, many top companies have forced their employees to use Outlook client on their Windows PC for reporting, conversations and other email related works. For people who can’t afford to buy the full office suite, they should try out the below best outlook alternatives along with a free office software. This is a free email client for Windows, Apple Mac, and Linux. It has been developed by Mozilla Foundation. Thunderbird is powered by Firefox web-browser. Its setup is as easy. To get started with Mozilla Thunderbird, you have to enter your password, a username and an id in the accounts window. Unlike other email clients we’ve mentioned in this article, Thunderbird allows you to choose IMAP or POP3 protocols for email delivery/receipt. It allows you to tag messages, create tasks, events, contacts, etc. Events for the day are displayed in the right-most column of ThunderBird’s interface. This software has a beautiful calendar and tasks tab which you can easily switch. It detects spam messages automatically and adds them to the junk folder. To improve productivity, you can download and install extensions supported by Firefox. Thunderbird client supports tabs. Thus, it is easier to work with it. Visit Mozilla website to download Thunderbird. This is yet another good alternative to outlook. This software will request you to choose a theme before you configure your email accounts. After you select a theme, you’ll see an option to import accounts and data from outlook. Setting up Em Client is an easy task. You have to enter login credentials for your email service provider and follow the instructions that appear on the installation wizard. EmClient has a neat interface and it offers a lot of tools. It allows you create new contacts, tasks, distribution lists, and events. EmClient includes a calendar tool where your tasks/events will appear. It has an option to backup all your mailing data. You can sort emails on the basis of their dates. EmClient has a search tool too. Unlike Inky, emails are not categorized in any other folder than the inbox, spam, draft, sent, etc. However, switching accounts are much easier and faster. Passwords are stored offline. Thus, make sure that you have installed a good antivirus software on your PC to keep the login data safe. In EM client, you can customize the appearance of every module that you see on its main interface. This software is free to use for the non-commercial use. You have to activate it with a free license key (generate it on emclient.com website). Download free version of this program here. It is a cloud-based service that supports various popular online email programs. Inky users should create an account after which, they’ll be prompted to add an email account. This program automatically detects SMTP, POP, IMAP addresses and port number for Gmail, Yahoo, Outlook, AOL and other services. Once your login id and password has been validated, Inky will display a guided tour that makes you aware of its features and tools. This program categorizes your emails and it includes powerful filters to sort them. For example, emails sent by Facebook, Twitter. and Google plus will appear in the social folder. Emails that you send to your own address can be accessed in the notes folder. You can easily manage subscriptions to websites and multiple mail accounts at a time with inky. Emails are downloaded to your computer when you use this software. Inky supports icon customization. You can change the icons type and its color by navigating to the settings window. Your inbox will be refreshed automatically. The free Inky client is available for MAC as well as Microsoft Windows. Its design is good and navigation to folders, accounts, and other utilities is easy. Inky requires 95MB installation space on the hard disk drive of your PC and an internet connection. 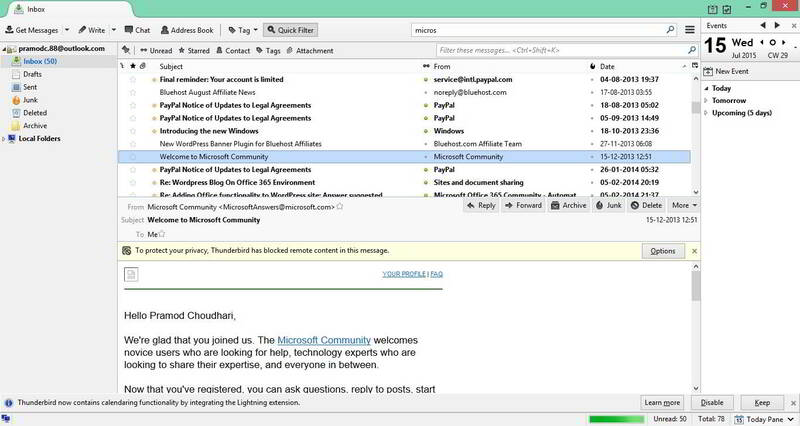 It is a free email client program and one of the best outlook alternatives for Windows PC. Conclusion: By this time, you might have become aware of the fact that free email clients and outlook replacement programs are useful as they allow you to work simultaneously with Gmail and other similar services. If you have more than 2 email address, install any one of the above software on your computer and configure them as per your requirements.